Tan Sri Ong Tee Keat and Syed Abdul Razak Alsagoff a.k.a Pek Moh Bukit Lanjan are captured in visual in the former’s office. Pek Moh had sought some advice from Ong on his maiden attempt to seek public office in the 14th General Election. 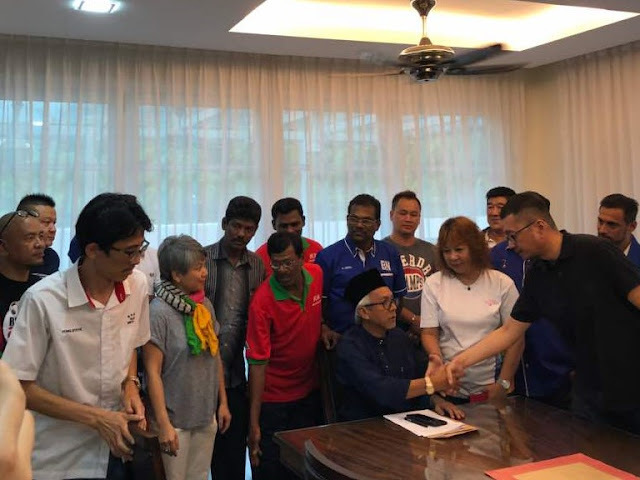 Syed Razak a.k.a Pek Moh (White Haired) Bukit Lanjan, a businessman, has decided to serve Bukit Lanjan folks full time if he is elected as their assemblyman in the 14th General Election (GE14) on May 9. Being half Chinese (Syed Razak’s mother is Chinese), Pek Moh proudly identifies himself as a Malaysian First. 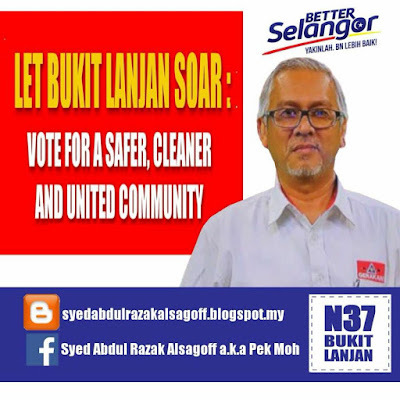 Pulse of Bukit Lanjan was launched on Dec 3, 2016, soon after Gerakan announced Syed Razak as the party’s nominee to contest N.37 Bukit Lanjan in GE14. Sixteen months after, this blog has 600 postings. The postings are aimed at highlighting the woes of Malaysians and to try and get the authorities to act accordingly in the interest of Malaysians. Syed Razak does not indulge in political mud-slinging or rhetoric that cannot be fulfilled. Judge for yourself on the 600 blogposts here. 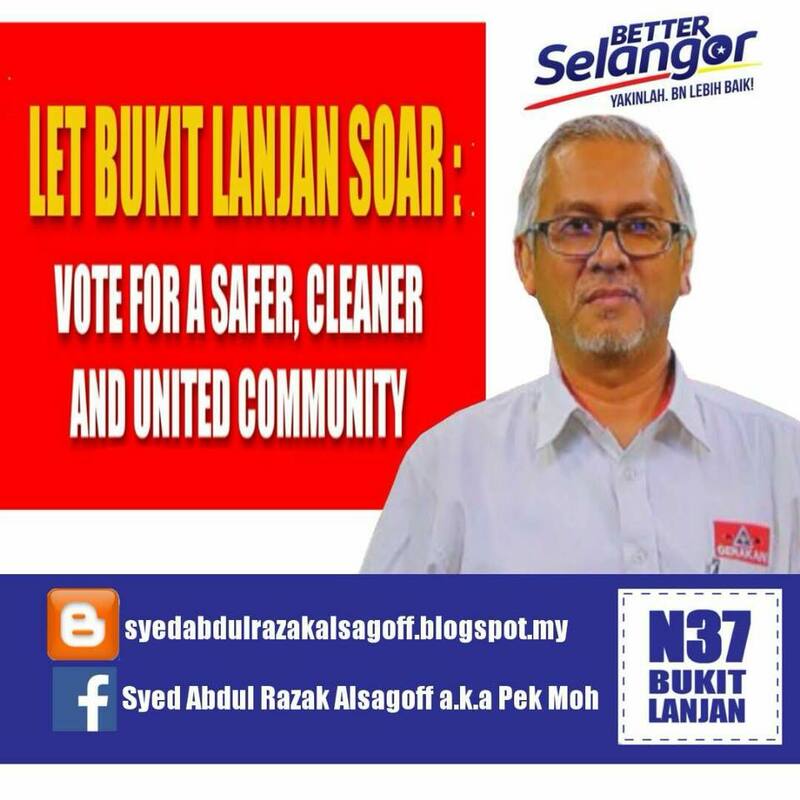 As he is contesting for a state seat, he is focused on what an assemblyman needs to do for his voters and communities - thus his election campaign tag-line “Let Bukit Lanjan Soar: Vote For A Safer, Cleaner And United Community”. And Syed Razak has stressed that to make Bukit Lanjan safer, cleaner and a united community or neigbourhoods “is doable”. It takes a lot of hard work but it is achievable with sincere, committed and dedicated service, without fear or favour, all aimed at helping to raise the quality of life the public. Please view the above video clips to get close and personal with Pek Moh and then judge him, not his party or his political coalition. I Am Malaysian First, are you? Syed Razak at a Chinese New Year 2017 Open House gathering with his multi-racial in-laws. 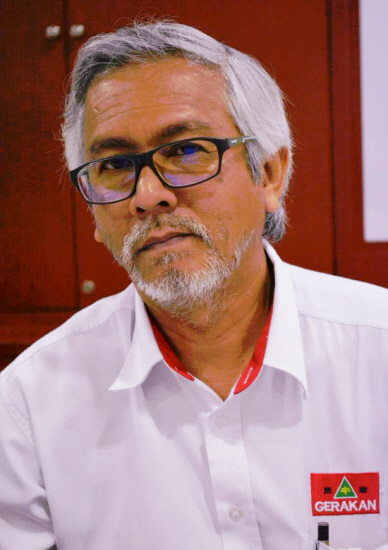 Gerakan Deputy Speaker Syed Abdul Razak Alsagoff and his other four siblings were single-handedly raised by their Chinese mother after their father passed away on June 3, 1973. Syed Razak, who is Gerakan’s nominee to contest N.37 Bukit Lanjan in the coming 14th General Election (GE14), wishes to pay tribute to his mother, Ang Siew Lan @ Asmah Abdullah. This will also help Bukit Lanjan constituents get to know Syed Razak better and help them consider electing and giving him a chance to serve them sincerely, honestly and without fear or favour. "My late mother Ang Siew Lan @ Asmah Binti Abdullah was born on 22nd December 1921 i.e Winter Solstice Festival. She passed away peacefully on 6th May 2017 at the ripe age of 95+. After my late father Tuan Syed Long Bin Syed Mohamed Alsagoff, a hospital assistant, passed away on 3rd June 1973 at the age of 66, it was my mother who single handedly brought us up and was responsible for who we became in life and society! Syed Razak at another Chinese New Year 2017 Open House gathering with his multi-racial in-laws. One of my brothers became the first Malay to have scored 8A’s in OSC (Overseas Senior Cambridge) in 1969 from Malay College Kuala Kangsar and went on to Cornell University USA on a Biasiswa Putra Yayasan Tuanku Abdul Rahman (equivalent to a Queen’s Scholarship). My sister, who was in Form 6 in Convent Bukit Nanas read English Literature from UM and went on to become a lecturer in USM. My brother before me did MBBS medicine from MU and later on obtained his FRCS from Edinburgh & FRCS Glasgow and became Pengetua Ibnu Sinna UM and then Orthopaedic & Trauma Surgeon at Tung Shin Hospital before practising at Ampang Puteri Hospital. He was the past President of Malaysian Orthopaedic Association and also Past President of ASEAN Orthopaedics. I was a former remisier and now Penyelaras DUN (Dewan Undangan Negeri) Bukit Lanjan N.37 and Deputy Speaker of Parti Gerakan Rakyat Malaysia, a multi-racial party and founding member of BN (Barisan Nasional). We all owe a great debt to our late beloved Mum and hence, my niece Dr Sharifah Tasneem Alsagoff pieced together the above pictorial tribute to celebrate how she lived instead of mourning her passing! Innalillahiwainnailaihiroji’un! Al Fatihah! May she be placed amongst the righteous! Amen!"